Hello Everyone and Welcome to Day Four of DUTCH OVEN WEEK! If you don't have a Dutch Oven (horrors!) you can just make this in a large covered casserole dish! One of the things I have enjoyed most about blogging is trying out new recipes that I have found from other's blogs. I call these recipes, "Recipes From the Hood, " meaning recipes I have found from the food blogging "neighborhood." 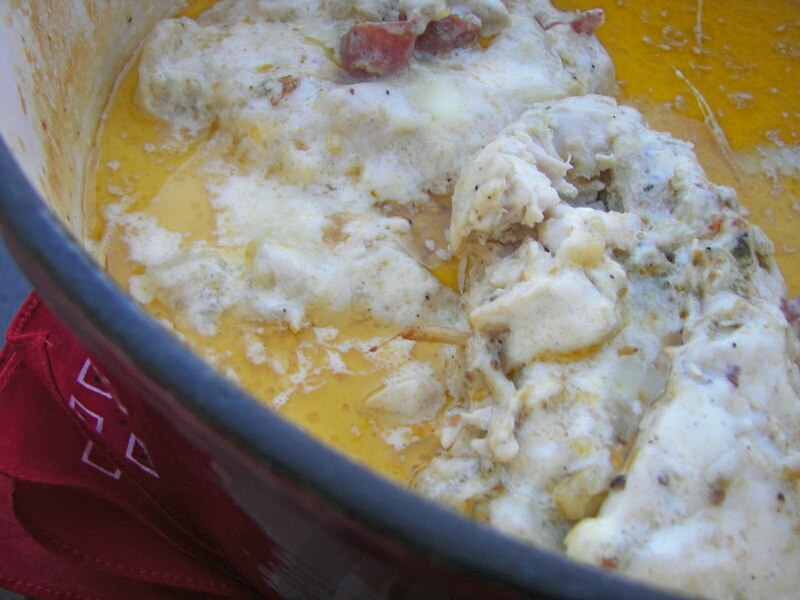 Recently, I ran across this recipe Dutch Oven Sun-Dried Tomato Pesto Stuffed Chicken on "Our Family Treat." a blog written by Lindsay who is a busy mother of three children under five! She has been blogging since April 2009. Take a minute to peruse her recipes; her most recent is a Greek Pasta Salad which I am also anxious to make. I really love her recipes; check out her blog HERE. Then I saw Lindsay's Sun-Dried Tomato Pesto Stuffed Chicken made and reviewed on "Dutch Oven Madness" written by Toni who gave the highest marks to Lindsay's recipe. Toni writes a blog about Dutch Oven Cooking and has committed to make a Dutch Oven Recipe every day in 2010! After almost six months (and 203 recipes), she has become a Dutch oven expert! Check out her blog HERE. 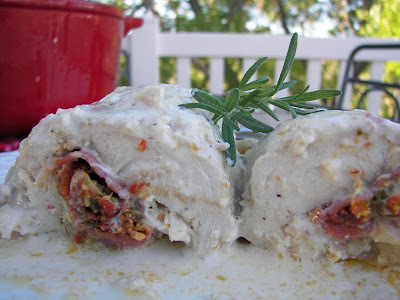 I made this recipe last night and the "food critics," my husband and children raved about it! Some of them said that it was the best main dish that I have made since blogging. The "stuffed" part of the chicken, the pesto with the salami and cheese, tastes so good and the sauce just tops it off. I want to thank both Lindsay and Toni for the recipe for Dutch Oven Sun Dried Tomato Pesto Stuffed Chicken. I know I will make it again and again! This week I have featured recipes for Dutch Oven Potatoes and a recipe for a Mountain Man Breakfast using an outdoor/camping Dutch Oven. Last night I took the easy way out and used my indoor Dutch Oven when I made Chicken Stuffed with Sun-Dried Tomatoes. It is a bright cherry and cheery red color. I love cooking with it. My husband gave it to me as a present last year. It is a Tramontina brand, a low-cost Dutch Oven which has had great reviews. 8-10 Boneless skinless chicken breasts pounded out until about double in size. My chicken was not really cooperative, but I did the best that I could with my metal mallot. I liked pounding the chicken as it took out some agression that I was carrying around! 8-10 slices provolone cheese -- Use one slice per chicken breast. 8-10 slices of a dry salami -- Use one slice per chicken breast. 1/4 cup sun-dried tomatoes -- I used sun-dried tomatoes not packed in oil. 1/2 container of sour cream (8 oz) -- I used low-fat. 3 cups heavy cream -- I didn't use heavy cream, but next time I would do so. Lindsay's picture shows her sauce much thicker than mine. 1 cup parmesan cheese -- I used the pre-grated cheese in the dairy section. Start by pounding out your chicken breasts using a rolling pin or a mallet as directed above. In a blender or food processor, mix the pesto and the tomatoes until fully blended. You may need to add some more olive oil if it seems too dry. Season each side of the breasts with salt and pepper. In the middle of the breast place a teaspoon or so of the pesto mixture, a slice of cheese and slice of salami. Fold the chicken, similar to a burrito, so that the inside ingredients cannot easily leak out while baking. Use toothpicks to secure chicken. Wrap in a Tupperware, and keep cool until you are ready to cook. Repeat with all the chicken breasts. In a dutch oven, over 12-15 briquettes (or camp stove to start) brown the chicken breasts, seam side down first, in a tablespoon of butter. Once browned on all sides, remove from oven, and let rest covered in foil. To the dutch oven, add the rest of the butter, and whisk in the flour. Add the cream, sour cream, and cheese. Stir over the heat until it begins to tighten. Put the chicken back into the sauce and cover. Cook for 45-50 minutes using 10 briquettes on bottom, and 10 on top. If you are using an inside Dutch Oven like I did, bake in a 350 degree oven for 40-45 minutes. While baking, I occasionally basted the chicken with the sauce. Notes: I had a lot of sauce left over, but I didn't mind because then I didn't feel so guilty about all the fat in the dish. You could try to make this with less sauce, but I liked that it cooked in the sauce. If I would have used heavy cream, my sauce would have been thicker. This is my stuffed chicken ready to serve. The sauce has separated a little bit, but it came back together nicely once I stirred it. Last year the "food critics" didn't enjoy my camp cooking! I think this would be a great dish to make while camping! If you did the prep work ahead of time, you could have a gourmet meal in less than an hour! I am so glad you liked it! 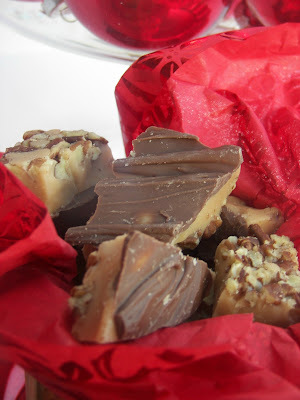 Thanks for sharing our recipe with your readers!! I didn't know someone else wrote about it too...I just checked out their blog! That chicken looks wonderful and I know that everyone here would like all those tastes. 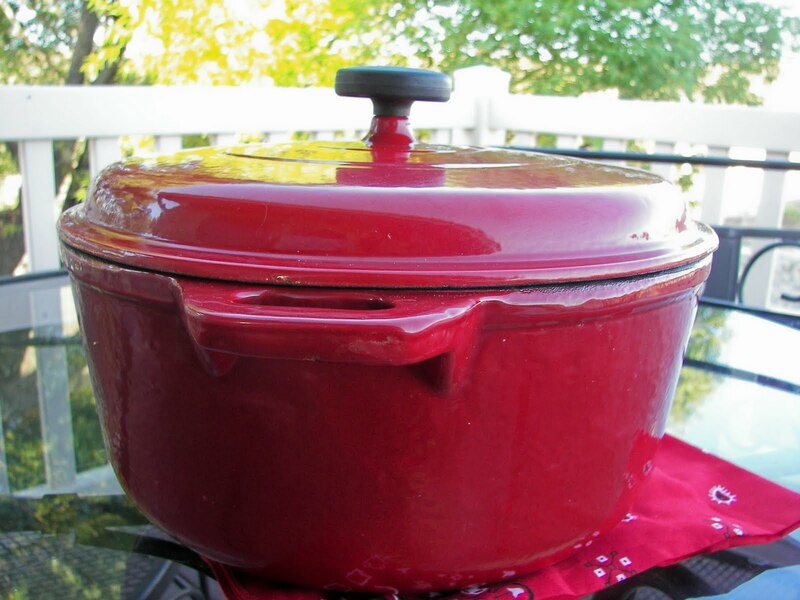 Out comes my Dutch Oven, even if it is a warm summer day! I am all for this! Yummy. It sounds and looks fantastic. I have to check out more about cooking in a dutch oven - love the idea...maybe if we get brave enough to vamp again we can be much more creative with our meals! Thanks for linking up. You have shared some fab recipes this week, Joni. I'm after a cast-iron enamel pot too, so thanks for sharing. I'm going to try this mouth-watering chicken on our next camp-out. Thanks Joni...I heart visiting you! This sounds good, had to crack up at "recipes from the Hood"! I am drooling! That chicken looks so yummy! Oh that looks so delicious! I'm going to have to try this!! Thanks for sharing. That looks terrific. I have a dutch oven that I use a lot in the winter months. I tend not to think of it as summer fare, but you're giving me the inspiration to give it a try. Thanks so much for being a part of Summer Sundays. Looking forward to seeing you next Sunday. This is my 5th try to comment. It keeps kicking me out - have you had me blocked???!!! JK, but I love this and love the lady who is doing dutch oven every day . Don't know where to start with her recipes. Let's do a dutch oven night in the fall again. Yummo! I might just have to give that a try. 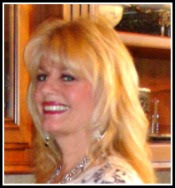 I will go and check out Lindsay's blog too-thanks for letting me know about it. Joni, I'm so impressed that you make one Dutch Oven dinner a day. That's a lot of work! This recipe looks wonderful. I might just have to get the ovens out again!